Since November 4, 2015, Canada has admitted more than 40,000 Syrian refugees. More than 25,000 of these refugees arrived between November 4, 2015 and February 29, 2016. These refugees are now settling across Canada. Many are or soon will be looking for work. To help refugees find work, Immigration, Refugees and Citizenship Canada (IRCC) funds programs that help refugees to learn English, gain occupational skills, recertify their credentials and connect to employers. Despite these efforts, only about 50% of privately sponsored refugees (PSRs) and about 10% of government-assisted refugees (GARs) earn any kind of employment income in their first year in Canada. When government or private support ends after twelve months, many refugees are still without a job. 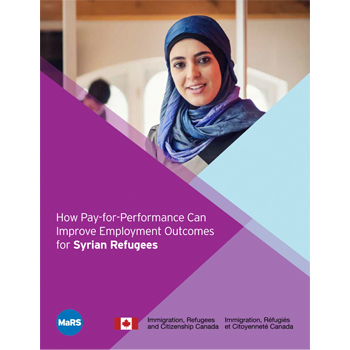 In December 2016, IRCC commissioned MaRS Centre for Impact Investing to research how pay-for-performance might improve employment outcomes among Syrian refugees. Under a pay-for-performance agreement, a settlement program would be paid based on its outcomes rather than only on its activities. MaRS explored how different pay-for-performance models, including Social Impact Bonds, might improve employment outcomes. MaRS recommended ways to improve employment outcomes for Syrian refugees by tying payment to outcomes and by focusing program design on specific, measurable results.